No mothing last night because I was on the 8.03pm from King's Cross back home and I was dog-tired when I crept back in. Age... 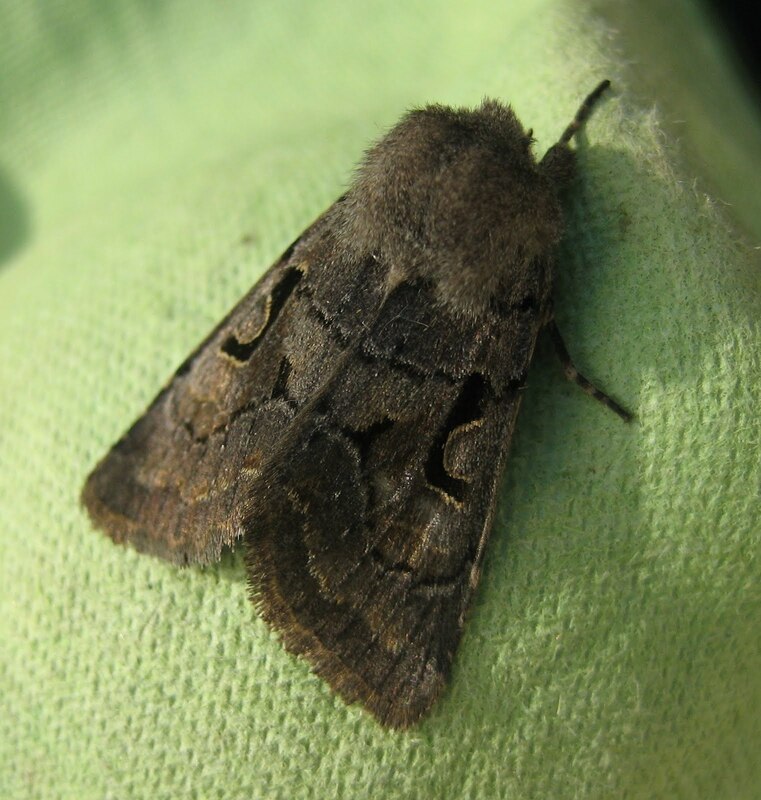 But I was in London for an interesting purpose, interviewing Madeleine Moon, the 'MP for moths', for a Radio 4 programme about our little flying friends which goes out at 11am on Friday 6th May. I'll tell you more later cos the day's duties beckon, but MM is a totally excellent promoter of the study of moths. 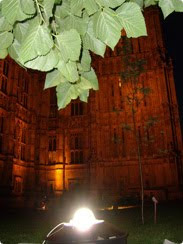 She has hosted five Moth and Bat nights in Parliament where Butterfly Conservation regularly run a trap (thanks to them for the picture here), and raises the subject of moths at many opportunities. 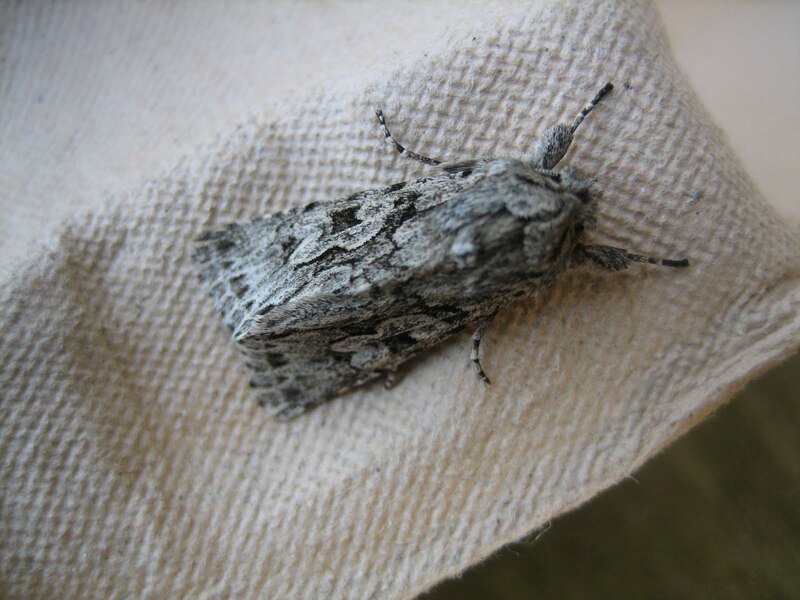 Tony Blair was startled on one occasion when she told the chamber about the Blair's Wainscot (one of an unmatched three moths named after a Dr Blair who trapped very knowledgeably in the 1940s on the Isle of Wight, an obvious landing point for species new to the UK). I don't know if the former PM ever wore a waistcoat and wondered briefly if she was commenting on this. She is also intrigued by Large Yellow Underwings' counter-measures against bats' sonar (a misleading burst of chirrupy sounds) which may be useful one day in her work as a member of the Commons select committee on defence. More soon, though I must just add that her interest in the natural world is wide-ranging. Her husband is a noted ecologist and when she was Mayor of Bridgend, her constituency in south Wales, they were raising an abandoned blackbird chick which became so dependent on them that they had to take it to civic receptions. A quiet night, a quiet moth. Although it was warm when I lit the trap at about 8.30 last night, the frost arrived in the small hours and this morning is chilly again. There were about 50 moths in the egg cartons, all familiar: quakers, drabs and Hebrew Characters. Still beautiful, though, in their gentle way, like this Common Quaker with its particularly well-defined wavy cross line. The wood grain is just as good, don't you think, and they both match in their Laura Ashley, camouflage way. Here's a coincidence, of the sort Arthur Koestler enjoyed collecting in his later years. Two days ago I featured the Herald, a favourite moth, and described how it hibernates over the winter in nooks, crannies and similar dark places. Yesterday, I was poking around in the garage for something to use as the base of a duck house. We've got a small pond and a duck and drake have come across it and are pottering about, exactly like a young couple house-hunting. I found the remains of a worktable, crudely knocked together from bits of gash wood but still more-or-less intact and forming the frame of a square box. I lugged it into the daylight and saw...the slumbering Herald above. It was deeply asleep, as I guess you'd have to be to survive the sort of winter we had this year. It took about an hour for its metabolism to wake up, during which I was sawing and hammering so the box was rocking about. Then off it flew. Something else seems to be hibernating in the cocoon. Flies? Mites? Anyone got an idea? I've left it in what is now an Anneka Rice-style, done-in-a-day, duck house for our new neighbours to inspect, if they move in. 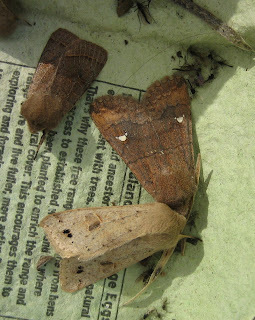 I'm giving the moths a rest this weekend, not just because it's gone colder but to avoid over-trapping. I don't know if this is a real danger - Ben & Co, advice welcome - but it seems common sense not to bring the same specimens to light over and over again. They mostly just doze away but it isn't a natural experience for them. Here instead is an advert from The Economist which caught my eye. 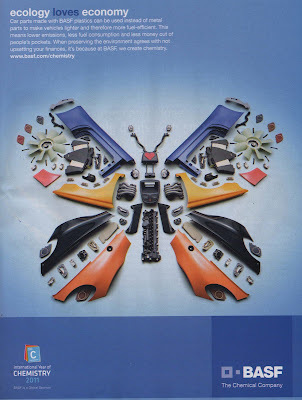 A curious combination: butterflies and plastic car parts. Top marks, though, to the designer who sorted the arrangement. It made me think nostalgically of tapes, which is where I used to see the initials BASF. I'll be most impressed if any reader knows what they stand for. Check out the company's interesting entry on Wikipedia to find out. I said I was giving the moths a rest but that isn't entirely true. In order to show my mother-in-law and brother-in-law the felled trunks of our frost-destroyed Cordyline australis, one of thousands of such victims currently a sad sight in the north of the UK, I turned on our back door's outside light. Within minutes, a moth was fluttering suicidally close to both the light and an adjacent web spun by a cunning spider. Sorry the picture is so poor, but you should be able to make out both moth (to the right) and strands of web. I just checked this morning, and I am pretty sure it escaped. I am recycling the Cordyline as (a) tree house thatch, using the leaves, as mentioned a few posts below (b) a raft modelled on Kon Tiki using the fibrous trunks and (c) also using the trunks, a floating platform for a duck and drake who have settled on our pond and may need somewhere fox-free to nest. You can read more about this on the Guardian's new Northerner blog btw, though now that the clocks have gone forward (have you remembered..?) you may not have the time. A couple more arrivals, typical of early Spring. First comes the Early Grey, whose salt-and-pepper colouring makes a welcome change from the current general palette of brown. 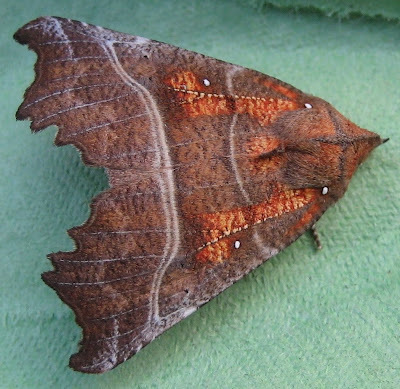 And then the Hebrew Character, whose patterning repays a close look. I have the familiar problem of an ageing blogger, that I've written about both these before, more than once. But I will repeat my feeble (but true) quip that the Early Grey always sounds like some endearment which Lady Grey might have used to the namesake of that lovely tea. My mind plays a similar trick with the weblink shortener Tinyurl, which conjures up images of a small member of the House of Lords. Penny and I mix Earl Grey half-and-half with supermarket sawdust for our morning brew which, as it happens, I am savouring in between typing this in bed. I very much recommend it. Lady Grey has her own tea too, and that's also a good mixer. As for the Hebrew Character, I photographed one a couple of years ago on a page of the Hebrew alphabet, showing how the dark mark on each wing does indeed look very like the letter Nun. So I leave it at that for now (and for any reader to decide if they have the energy to scroll back and back and back...) and just say: Welcome both, although the Met Office says we're all going to get a chilly shock later this weekend. When I was young, we had a couple of Triumph Herald cars in succession - one of them an insanely high-powered beast for a small saloon, a six-cylinder Vitesse. When my Dad turned right at the Weetwood junction of Leeds ring road and pressed the accelerator, we virtually took off and only came back to earth at the Lawnswood roundabout. Anyway, I always like the cars' perky looks (eyelids on the headlamps) and their cheery name. The same applies to this lovely Herald moth which graced the trap last night. The wing colouring is self-evidently fine, including those four white spots, but I've also included a picture below of its natty white legs. It's an interesting moth, this one. In spite of its excellent condition, it will have spent the winter hibernating - "in an outbuilding," say Waring, Townend and Lewington, adding romantically "or a cave." We don't have any caves but there are plenty of nooks and crannies at Wainwright Towers, although most have been occupied during the freeze by ladybirds (including the invasive Harlequin). Heralds have two generations annually, one in the summer and the second which hatch from their cocoons in August-November and then - like this one - hunker down. It suddenly went warm this week and after only intermittent trapping since last October, I decided to turn the light on, just in case anything was about. I've been a bit dozy; checking the Moth Bible (Waring, Townsend and Lewington), I see that plenty of species are likely to have been on the wing since early March. And so it certainly proved. 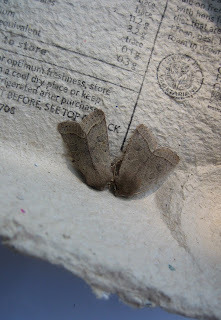 The ones which settled here are mostly Common Quakers, like this cosy pair getting together on the left. 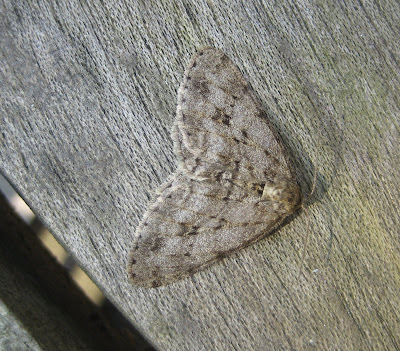 You can see the reason for the name in their modest and unshowy colours, but the patterning is delicate and fine. 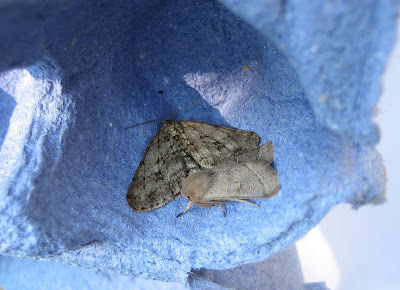 There's also a lovely Pale Brindled Beauty, above at the top with another Common Quaker in my strangely beautiful blue eggbox, and also below. A couple of other, more distinctive arrivals in the final picture for today: a Twin-spotted Quaker, a little more daring than the others, like those kids at school who made ingenious if very small adjustments to their uniforms; and a Satellite, with that wonderfully specific white mark and its two tiny attendants. Hence the name. 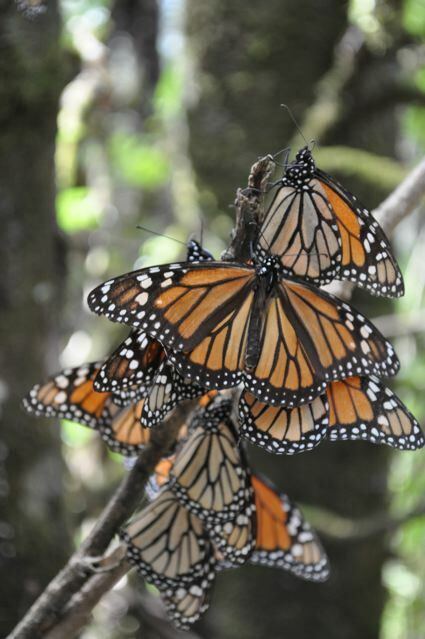 I'm not specially Royalist, although I can't think of a better head-of-state system offhand, but I hope you'll forgive a few more pictures of the butterfly kingdom's Monarchs. First, though, here's another Mexican butterfly; in fact the only other one which I was able to stalk and photograph. I think that age is creeping up on me more successfully than I managed to creep up on the butterflies. This delicately beautiful shade-lover, with its marvellous camouflage, was darting about in the Mayan ruins of Coba when Abi spotted it. 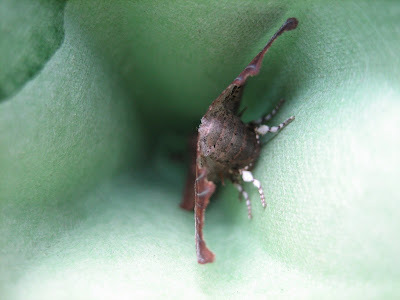 Like the fritillary in the previous post, I will look it up later, helped by the bugs website kindly pointed-out to me by my 'Exile to a Pompous Land' pal. One thing about the Mayan ruins btw: they are all pronounced differently from my expectations. Thus it's CoBA, and ChiCHEN ItZA. There's a useful tip for life. Now the Monarchs again - and these are pictures taken by Abi, as is obvious from the better definition achieved by her steadier hand. Aren't they great. I wish I was back there, as I gaze out at early March Yorkshire and the ruins of our Cordyline australis which has had a probably terminal battering from the very cold weather in the UK this winter. You can check out its stark remains on www.guardian.co.uk/uk/the-northerner. But there is a good side. Inspired by Mexico, I plan to use the fallen 'dagger leaves' to thatch my tree house extension. 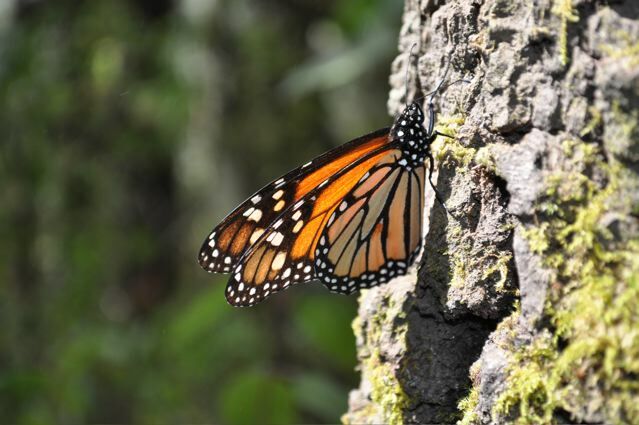 My son Tom, who is the Economist's man in Central America and the Caribbean, made a virtue of our visit and had a piece in about the Monarchs the following week. 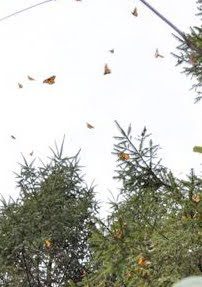 I can't link it cos you have to subscribe, but it reported on increased numbers of butterfly migrants this year, and a decline in illegal logging in the forests which are so vital to them. As he pointed out, this is an example of increased tourism actually helping a natural habitat rather than putting it at risk.